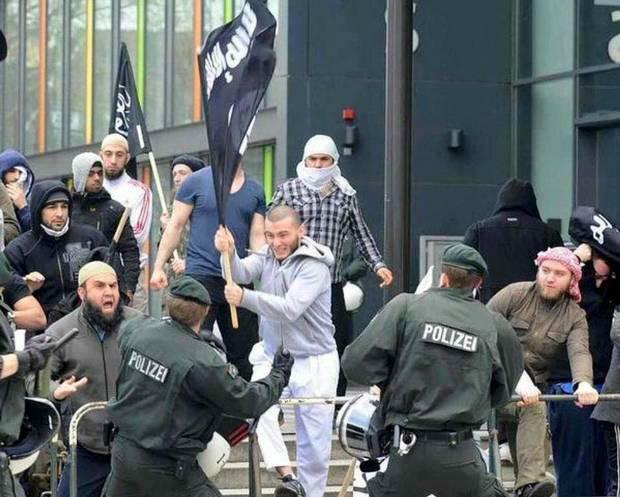 A picture that purports to be of refugees carrying Isis flags and attacking police has been shared widely on social media this week — but the picture is from 2012 and has nothing to do with refugees. The image has been picked up by a range of right-wing outlets, including the Conservative Post, and has been shared tens of thousands of times since. That site said that it was a "new leaked picture" that "confirmed" its claims about Isis smuggling in agents among refugees. The image has been used to confirm a theory that has taken hold among many right-wing sites — that Isis is using the Syrian refugee crisis to bring thousands of terrorists into Europe, among people who are fleeing the group. The picture appears to have come from protests in Bonn in May 2012. The protest began as one by a then ascendant far-right political party in the country, and the Muslims in the picture were part of a counter-protest. Other uploads were around at the same time, confirming that the picture is just over three years old. Video of what appears to be the same protest — at an anti-Islam rally in Bonn — can be seen on YouTube (below). The footage was uploaded on 2012, and appear to come from the same year — long before the flag took off as a widely-understood symbol of Isis. As many analysts have pointed out, Isis took on the symbol partly because it was already a well-established icon, and had been used by other groups. “They want to align themselves with other movements and place themselves in a jihadist context,” Charlie Winter, a researcher at the Quilliam Foundation, told The Independent earlier this summer. “The shahada and the Prophet’s seal are important symbols that all Muslims share.